Japan says it could shoot down missiles for its U.S. ally if North Korea fires them at Guam. Defense Minister Itsunori Onodera told Thursday’s parliamentary session that a missile attack on the U.S. territory would breach the U.S. deterrence against an attack on Japan. He said that would be a Japanese national emergency because it would threaten Japan’s existence as a nation. He said Japan in that case can exercise the right to “collective” self-defense and activate the Aegis destroyer ship-to-air missile defense system. Onodera’s comment underscores Japan’s growing military role and reverses its previous position that it can only shoot down missiles headed to Japan. A defense law that took effect last year allows Japan’s military to defend U.S. and other allies when they come under enemy attack. Gen. Kim Rak Gyom, commander of the North’s strategic rocket forces, made the insults via state media Thursday in response to Trump’s “fire and fury” threats against North Korea. Trump made the remarks during a meeting at his New Jersey golf resort. 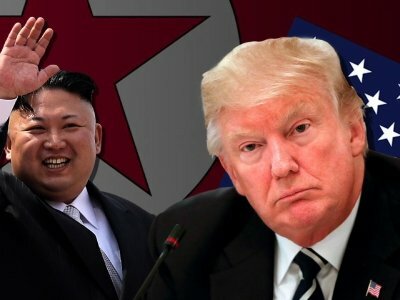 Kim said Trump is “extremely getting on the nerves” of his soldiers by making comments that showed his “senility” again. North Korea has unleashed personal attacks on past Washington and Seoul leaders. It called former President Barack Obama a monkey and ex-South Korean President Park Geun-hye a prostitute. South Korea’s military says North Korea will face a “stern and strong” response from Washington and Seoul if it acts on threats to fire missiles near Guam. Seoul’s Joint Chiefs of Staff spokesman Roh Jae-cheon said Thursday that the U.S. and South Korean militaries are prepared to “immediately and sternly punish” any kind of provocation by North Korea, but didn’t elaborate on how the allies are preparing. South Korea’s presidential office says top national security adviser Chung Eui-yong will chair a national security council meeting in the afternoon to discuss the North Korean threats. The North is responding to Trump’s threat in a statement from its military carried by state-run news agency KCNA. The statement says that “only absolute force” can work on someone as “bereft of reason” as Trump. The North Korean statement also says the military action its army “is about to take” will be effective for restraining America’s “frantic moves” in and near the southern part of the Korean Peninsula. The State Department says President Donald Trump is “on the same page” with the rest of U.S. government with his fiery threat to North Korea. State Department spokeswoman Heather Nauert says the White House, State Department and Pentagon are all in agreement. She says the world, too, is speaking with once voice. Nauert says Secretary of State Rex Tillerson spoke to Trump for about an hour after Trump warned Tuesday of “fire and fury” if North Korea escalated its threats. The U.S. ambassador to the U.N.’s Conference on Disarmament says he urged North Korea to “end its threatening behavior,” drawing a retort from an envoy from the reclusive Asian country. Ambassador Robert Wood tweeted Wednesday that North Korean “provocations came up at CD informal session” and that he urged Pyongyang to comply with U.N. Security Council demands. The 65-member conference is currently holding working-group meetings behind closed doors, with no press allowed. Diplomats said statements about North Korea made up a small portion of the meeting devoted to broader disarmament issues. South Korea’s delegation declined to provide its statement to The Associated Press, saying the meeting was not public. North Korea didn’t immediately respond to an e-mail seeking its right-of-reply statement by its representative, Yong Chol Ju. Nebenzia said Russia backs China’s proposed suspension-for-suspension, which would see North Korea halt nuclear and ballistic missile activities and the U.S. and South Korean halt military exercises. He says this offers “a way out” of the current situation. Mattis says any action by North Korea would be grossly overmatched by the U.S., and that Pyongyang would lose any arms race or conflict it started. He says that while the U.S. is pursuing diplomatic solutions, the combined military power of America and its allies is the most robust on Earth. Mattis issued a statement as he traveled to the West Coast. His comments punctuate President Donald Trump’s warning that North Korea will be met with “fire and fury” if it threatens the U.S.
A new report says Pyongyang’s nuclear program is progressing. France is urging all sides “to act responsibly and to de-escalate” tensions over North Korea’s nuclear ambitions. Bolivia is currently a U.N. Security Council member, and its ambassador says the escalating rhetoric between the United State and North Korea is “really detrimental” to the world body’s goal of maintaining global peace and security. Ambassador Sacha Llorentty Soliz “firmly” believes there’s no military solution to the North Korean nuclear issue. The Bolivian envoy tells reporters the rhetoric “goes against the spirit” of the latest U.N. sanctions resolution. In addition to imposing new economic penalties, that resolution calls for the quick resumption of international talks on the North’s nuclear program. Britain’s U.N. ambassador says the United Kingdom “stands shoulder to shoulder with the United States” in tackling the nuclear threat from North Korea and making sure it can’t pursue its nuclear and ballistic missile programs. North Korean authorities have organized a giant rally Wednesday as a show of support for their rejection of the latest round of U.N. sanctions. Tens of thousands of people packed Kim Il Sung Square in downtown Pyongyang for the event, which followed a familiar format of speeches from a balcony, with the crowd listening below, standing in organized rows interspersed with placards and slogans. The comments come as Trump and North Korea traded escalating threats. Trump’s heated rhetoric comes as his secretary of state seeks to downplay the words. The tweet came as Trump traded escalating threats with North Korea. Trump on Tuesday threatened “fire and fury” if North Korea made more threats to the U.S. And North Korea’s military said it was examining plans for attacking Guam. Trump retweeted news coverage about his heated rhetoric Wednesday. A Republican who’s a leading voice on defense issues says President Donald Trump has “basically drawn a red line” with his strong warning on North Korea. President Donald Trump is retweeting news coverage about his heated rhetoric against North Korea, even as his secretary of state is downplaying Trump’s words. Trump and North Korea have been exchanging escalating threats, with the North saying it was examining plans for attacking Guam. But Tillerson told reporters that nothing he’s seen or knows of in the last day dramatically changed the situation. Secretary of State Rex Tillerson says he doesn’t believe there is “any imminent threat” from North Korea, including to the U.S. territory of Guam. Tillerson spoke to reporters Wednesday after President Donald Trump and North Korea traded escalating threats of “fire,” with the North saying it was examining plans for attacking Guam. He downplayed speculation that the threats move the U.S. closer to a military option. Tillerson says nothing he’s seen or knows of in the last day dramatically changed the situation. Tillerson spoke to reporters as he flew from Malaysia to Washington, stopping in Guam to refuel.